In transforming any aspect of health and care, one obstacle occurs more than any other I’ve seen: it’s when people are out of touch with reality. And it turns out that’s a big problem with diabetes: a lot of the public has important misconceptions about what diabetes is, who’s “responsible” for having it, what’s true about people with diabetes, and so on. And one consequence of that is that the people who have the condition are often faced with stigma, sometimes discrimination, so sometimes they just don’t want to talk about it. And as with any medical condition, that helps nobody. One of the biggest diabetes drug companies is Novo Nordisk, and my hat is off to them for their direct, head-on, superb approach to debunking these myths. Example: many people think PWDs are basically impaired, so Novo Nordisk sponsors a team of world-class professional athletes (cyclists and runners) who all have diabetes. The cycling team is good enough that they’re working their way up the world rankings, with the goal of competing in the Tour de France in 2021 … the 100th anniversary of the invention of insulin. Announcement of two new, validated Stigma Assessment Scales being introduced at this conference. Please move through these slides – if you’re not interested in the academic work you can skip it, but please start educating yourself about diabetes by reviewing the other slides! Email subscribers, if you can’t see the slides or embedded YouTube, click the headline to come online. My highest kudos to TNN and Dr. Jane Speight for this work. Smart, perceptive, relevant, patient-centered, well done. More to come. I’m at the American Diabetes Association’s annual “Scientific Sessions” conference. I’m not here to speak – I’m here with two hats: on a press pass to blog about what I see from the patient’s perspective, and to collaborate with the amazing people from the diaTribe Foundation. I attended their “d16” workshop in January while I was in Palo Alto. It’s been a long time since I’ve seen such an intense, highly organized team of people attack any event or any topic. And I do mean attack – they are focused and coordinated. It’s kind of thrilling to think they want to hear anything from me. The other day my first post from this event was about the #OpenAPS artificial pancreas. More in my next post on the scientific poster they presented. Wonderful post, Dave! And while on one hand, I’m sorry to welcome you into our family, on the other hand, boy, we sure gained one hell of a guy! That being said, you’ve *always* been a real advocate, supporter, and fan of the diabetes online community, and for that we thank you. I also loved this presentation. There were some key points that really jumped out at me (and I’ll blog about them soon, too). 1) Slide/click 34 in the deck above blew me away. It talks about comparing what doctors and patients remember of conversations compared to an actual recording of those conversations. It said that people with diabetes correctly remembered a mean of only 0.6 decisions made during the appointment, but MORE interesting – they remembered a mean of 1.7 decisions that NEVER HAPPENED (weren’t found on the recording)! Health care professionals did slightly better remembering a mean of 0.8 decisions made during the appointment, but guess what? They remembered an astounding mean of 2.3 decisions that were not on the recording! That’s amazing to me! 2) Team Novo Nordisk’s efforts have been hugely successful in changing how NBC’s Pro Cycling announcers portray diabetes. 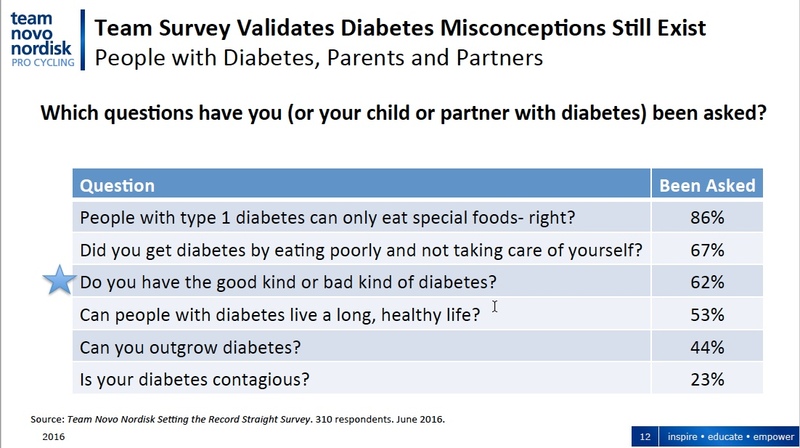 Before, it was “suffering from diabetes,” now it’s “living with diabetes” (slide/click 30). Thanks again for the great post, Dave! See ya around! Scott! Huge WordPress fail – I didn’t get a notification that your post has been waiting here for a week – sorry! The WordPress app seems to be the only thing on my new iPhone that completely misbehaves. Sorry! btw – all that stuff about people remembering conversations wrong – well DUH! One thing that amazes me year after year is that in healthcare, smart people spend stunning amounts of money to document that things that are no surprise elsewhere happen in health contexts, too! The other day I saw some new paper that provided evidence (EVIDENCE!! TA-DA!!) that depressed people have a harder time sticking to medication plans. Well DUH – what the @#$ do they think depression IS, anyway?? Is there ANY area of life where people’s performance is unaffected by depression?? I mean REALLY, people – you want complicated?? Cure kidney cancer – or diabetes. But everyday things like this ain’t complicated. And then others write articles about how the current method doesn’t work. I grin, but SERIOUSLY, if we can start to WORK TOGETHER to solve this, instead of documenting what doesn’t work, it would be a REALLY GOOD THING. Who’s Dr. Guzman, and what presentation where?